Flags of War: Happy New Year Give Away!!! Happy New Year Give Away!!! I would like to wish all of our customers and followers a Happy New Year and hope 2013 is good to you. 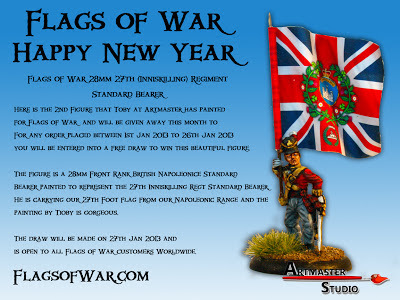 As part of the celebration for this year we have another free giveaway from Artmaster Studios and Flags of War. All orders placed between 1st Jan 2013 to 26th Jan 2013 will be entered into the draw to get this amazing figure. Finally got Posties Sedgemoor order in today, but as I paid, if I win the comp, the figures mine!!!! !